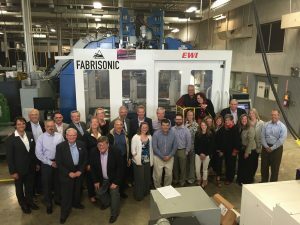 Fabrisonic was happy to have a number of people visit from Colorado Springs Regional Leaders and check out our largest 3D printing machine. The group included business and government, chambers of commerce, local economic development associations and local media who visited many sites around Columbus over a 3-day period. Included in the tour, was our very own Richard Celeste former governor of Ohio. Several of the visitors were able to physically enter the 3D printer and seemed to get a “kick” out of the experience. We are always delighted to have visitors and show them the exciting new technology that Fabrisonic has to offer. 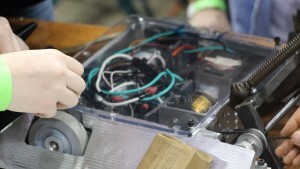 For more information on what Fabrisonic can do, visit www.fabrisonic.com. Fabrisonic recently helped out local high school students with manufacturing a robot for a battle-bot type competition called Xtreme Bots. 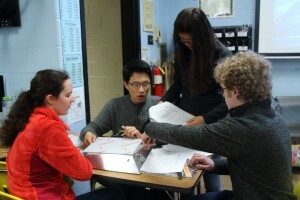 The team from Upper Arlington High School participated for their second year. Their entry this year was lovingly named ‘scrambled eggs’. All competitors were guaranteed three rounds of round-robin, and the top 16 seeds had a single elimination bracket. Scrambled Eggs won all three of its round robin rounds, and made it to the top 8, out of a total of 36 team. Overall, the UA team took seventh place. Take a look at the great slow-motion film of scrambled eggs throwing a competitor into the air. 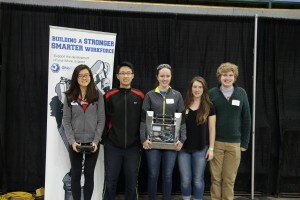 Fabrisonic is proud to support the next generation of engineers in STEM learning. Perhaps we will be seeing some of these young people working for us in a few years. Have you ever wondered how the science behind Fabrisonic’s 3D printing works? Well, now you don’t have to ponder anymore. Follow this LINK to an infographic that explains the science of our process in a nut shell. However, if you want to go into more depth about the metallurgy or technique, contact us directly by calling 614.688.5197 or shoot us an email at info@fabrisonic.com. Over the next few weeks, we will be posting more infographics that will go into a little bit more in depth each week.